Cast iron dutch ovens run the spectrum from very expensive to quite affordable. What should you look for before buying? Even though I am usually cooking for myself only, I wanted a really good cast iron dutch oven to use. A beautiful big pot of stew or fragrant soup makes me happy! 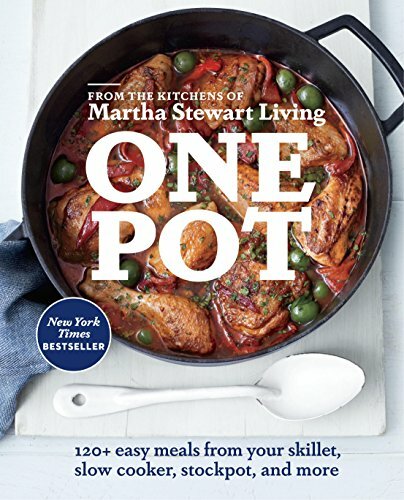 One pot meals combine flavors and nutrients to provide a healthy and delicious meal for one or many. For me, leftovers are a plus. I love going to the freezer and choosing an already cooked, homemade item to reheat and enjoy. For this reason I bought a medium size dutch oven. 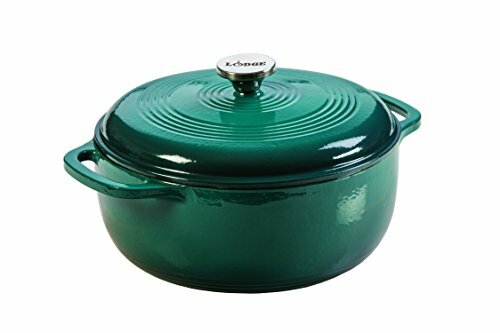 I chose the LeCreuset 3.5 quart dutch oven, but I searched all over and looked at different brands before I chose. Because of the high cost of French made pots, many people choose the Lodge brand which is much cheaper. This page shows all types of pots that have a good reputation and compares LeCreuset, Staub, Emile Henry, and Lodge. Tips on choosing the right pot for your needs. The first most important thing to consider when buying a dutch oven is size. This may be obvious but consider what you want to cook in your pot. A large family would need a big pot, but even singles or couples may want a large dutch oven. Save time by making big meals and enjoy the leftovers. A night off from cooking is always a good thing! My new pot is 3.5 quarts and it is not very large. (See my photos below). It would work for one or two people. All brands come in a variety of sizes. Color: If you are not picky, choose a cheaper color. 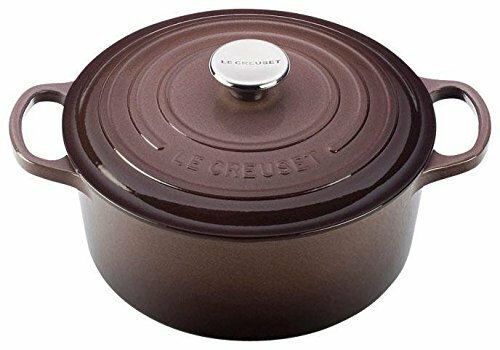 The Truffle brown LeCreuset I bought was $35 cheaper than any other color for the same size pot. Sometimes black or white is also less expensive. 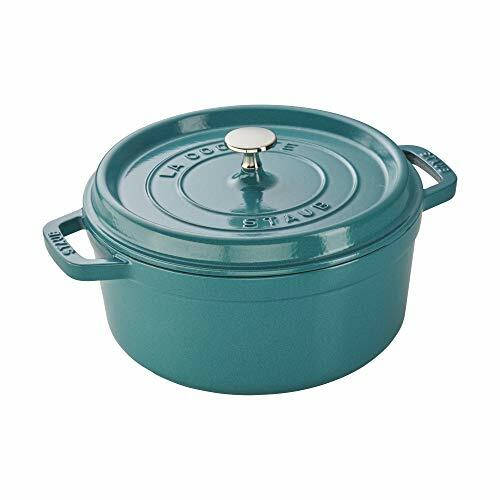 Handles: Open, large handles, like on the LeCreuset make lifting the pot easier. They are solid cast iron and can be very heavy, especially when full. Make sure your dutch oven can handle the heat. Most are fine to at least 500 degrees. 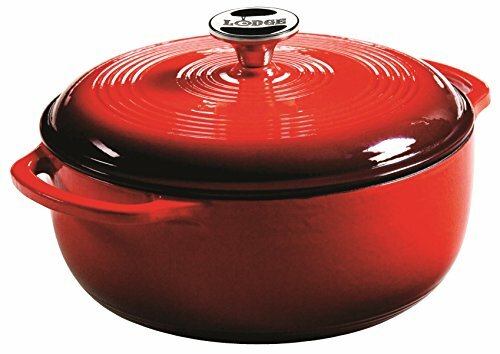 The Staub cast iron pot can take heat up to 900 degrees - without the cover. Food: Uncoated cast iron, like some of the Lodge pans, should not be used to cook acidic food, like tomato sauce, as it will harm the seasoning of the pan. 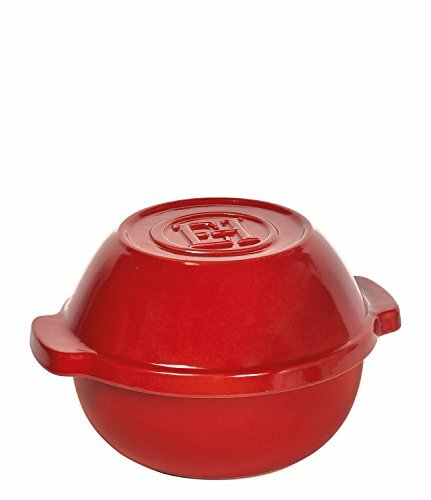 Enameled pots work best for cooking all food and sauces, and makes clean up very easy. Induction Cooking: All pans on this page are okay to use on an induction range, but the Emile Henry brand needs a special diffuser plate. When I purchased my Truffle color, it was on sale, but other colors include blue, caribbean, coral, green, red, white, orange, black and gray. What size Dutch oven do I need? Round, deep pans are most popular and come in many sizes. It is tough to see photos of pots online and get a sense of size. The tiniest LeCrueset pans are sugar bowl size, and quite honestly, that is about all they could be used for. If I am going to make a one-pot meal, I need my food to all fit in one pot. Most people don't cook meals for one. I cook only for myself, but I make recipes for four people. That way I can eat the food for more than one meal and freeze leftovers. Unless you have a big family, or make some really big recipes, the 5-6 quart size should be perfect. Remember that recipes can be cut in half, and they can be doubled, as needed. Oval shaped dutch ovens may hold whole chickens or roasts better, but I chose the round shape for cooking on the stovetop. An oval pan will not fit correctly on a burner. As you can see I can fit only 4 short ribs in this pot without crowding. The pot cleaned up easily and looks like new. Food was delicious! Search online for "no knead bread" and you will likely find lots of blogs showing how they made scrumptious bread in their dutch oven. I have tried some bread recipes and share my tips on the page link below. No-knead bread recipes are everywhere these days but not all recipes are good. Here I share my own experience and tips for baking bread in a Dutch oven. Bake bread in a dutch oven. The only real difference is interior color. Some of the best known dutch ovens are made in France. 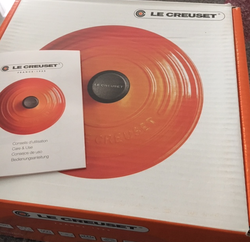 LeCreuset has been a long time favorite of mine (in looks - I've never owned any until now). 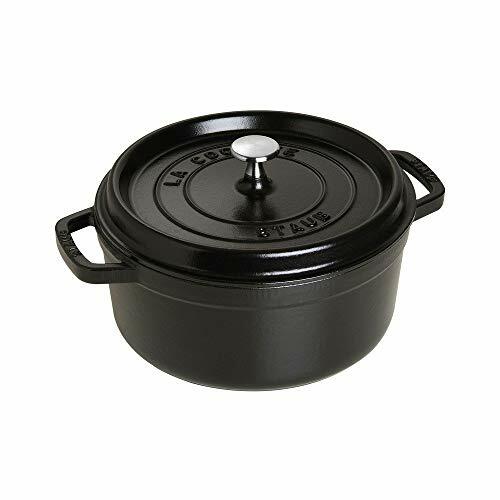 In my search for the perfect Dutch oven, Staub is one I researched. They have a unique cover design with little "self-basting spikes" that collect condensation which causes it to drip down over the food inside. I did not choose Staub because I wanted a light color inside the pot, and the Staub pots are usually black inside. The shape is distinctive, and it is really personal preference. Buy this one in matte black and save money. A pretty color can cost you $90 more! Now you may be wondering what the difference is between a crock pot / slow cooker and a dutch oven. I've use a crock pot for many years and food comes quite good. But meat is never brown, unless I first sear it in a separate pan on the stove. So a dutch oven saves that step because the same pot is used to brown and then cook. Most dutch ovens are made entirely of cast iron which distributes the heat evenly while cooking. 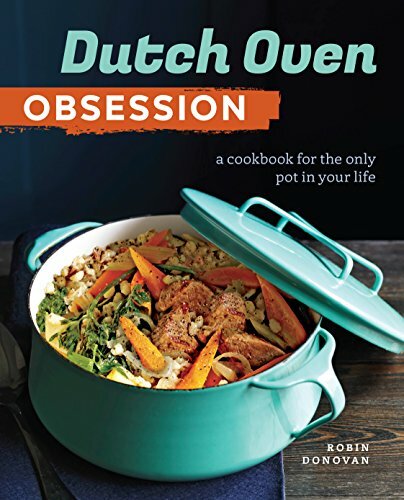 I own the "Obsession" cookbook and am writing a review. This video points out some important aspects of typical dutch ovens for sale. Dutch ovens for less than one hundred dollars to use at home or camping. 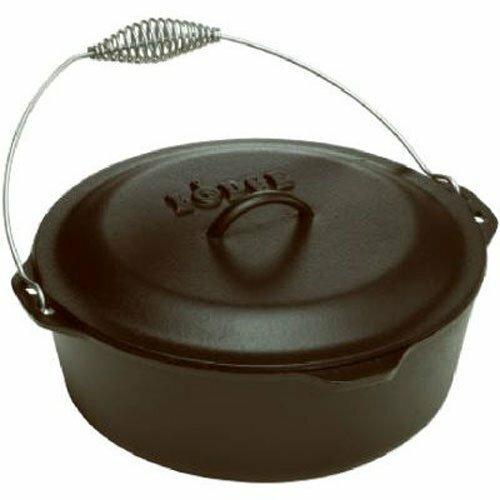 Lodge brand cast iron is a favorite among cast iron pan lovers. I personally have frying pans of many sizes made by Lodge. And I now have two dutch ovens, which are coated with enamel. 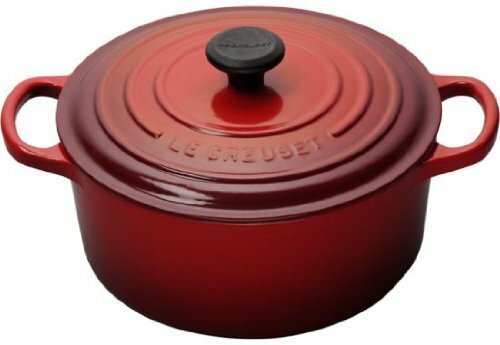 The Lodge brand dutch ovens can be purchased for far less money than the LeCreuset pots. I paid $240 for my ONE LeCreuset, and these two Lodge pots (shown in my photo below) cost less than $100 total. 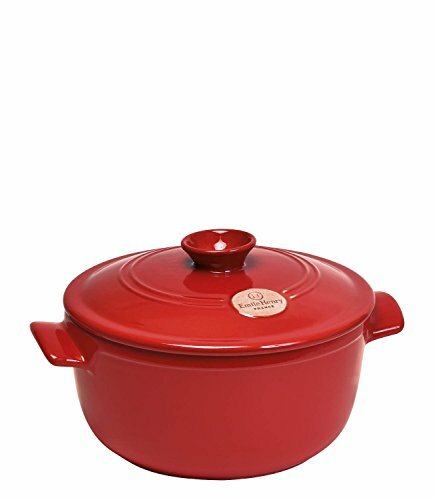 The smaller red one is perfect for making gravy or small batches of soup and stew. It would be perfect for a single person, cooking for one. The larger pot is 6 quarts and will hold a lot of food. I used it to make turkey stock from my Thanksgiving turkey. 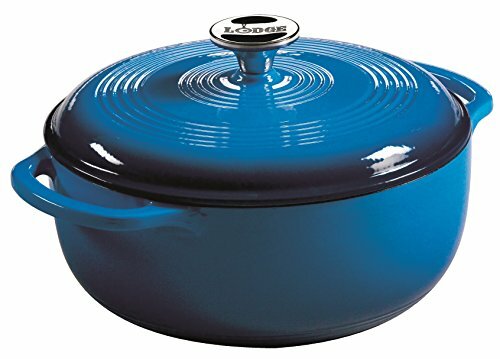 Lodge brand is way more affordable, but the lesser quality is obvious if you have a LeCreuset. Similar to the products above, Lodge pots are much cheaper. They come in many sizes and you could buy 3 or 4 of them for the price of one LeCreuset. Lodge pans that are all black, or black inside (uncoated) have special requirements for cleaning and storing. Whereas the coated cast iron is known for being easy to clean, the black, uncoated type is also easy to clean. But uncoated pans often need seasoning and must be stored with a coating of oil. Always let the pans cool before washing. Uncoated pans need hot water and NO SOAP - which is perfect for camping. Soak for a short time in very hot water for stuck on food. Otherwise, simply wash and rinse in hot water and dry thoroughly. Cast iron can rust, so be sure to add oil - immediately after drying - to the clean pan to keep it coated. 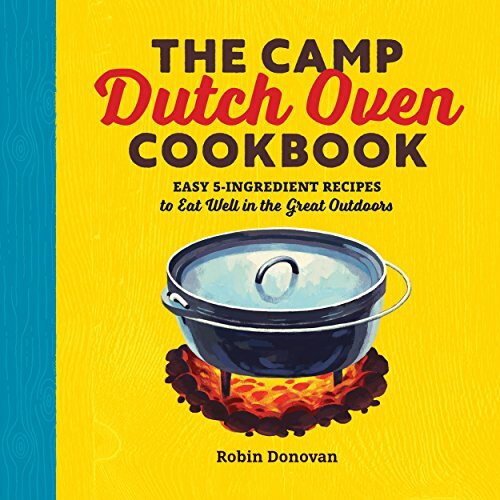 Dutch ovens, fry pans and other cast iron cookware for cooking in the wilderness. Emile Henry requires you buy a special "hob" for induction cooking. Emile Henry is yet another name brand with a very good reputation. I own individual pie plates by this company, but nothing else. I've seen lots of bread baking posts online which use the tall bread / potato pot. No Knead Bread is simple to throw together and place in a heavy cast iron or ceramic pot to rise and then bake. It gets rave reviews. Bread can also be baked in a regular dutch oven. Emile Henry offers some unique bakeware. Shop online and locally to find the best deals. My kitchen is very small, but I consider it to be the perfect size for me. As I was raising a family, I would never have spent hundreds of dollars on a fancy dutch oven. I would have chosen the Lodge Brand pot. Until very recently I never owned a Dutch oven, which is also sometimes called a French oven. Because of my love for soups and stews and one dish meals, and the fact that I am cooking only for myself these days, I splurged on one nice pot. I did shop around, but I did not check eBay, or local shops for sales. If you are in the market for quality cookware, shop around and keep an eye out for specials and sales. Search by your preferred brand. I am happy with my LeCrueset purchase, and plan to use this pot often. Because I also wanted a larger size, I chose Lodge for my second pot. The smaller size is perfect for cooking smaller meals, and the pot cleaned up very easily. I had leftovers to eat the next day. The LeCreuset will last a lifetime and one day I will pass it along. 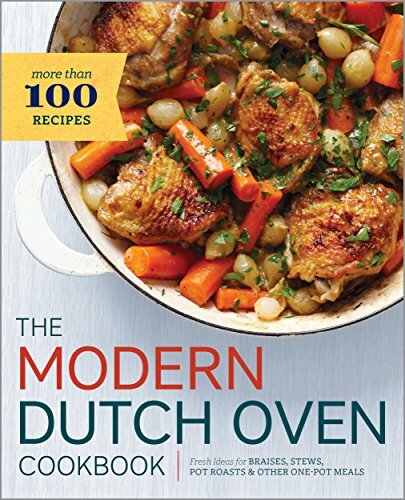 Do you cook in a Dutch oven? I plan to bake bread in mine as well Katie. What size is yours? I think I will need to halve the dough for the 3.5 quart size. I use my cast iron dutch oven for baking sourdough bread, it is a must. I can't imagine not having a dutch oven because the uses are endless. You must definitely use mitts or potholders on these products and the pans tend to be quite heavy as they are made of cast iron. It's one reason I chose the smaller size. dustytoes, Thank you for the practical information and product lines. Fortunately for me, I am not at all adverse to the darker colors since they often show less fading and wear. Do you use mitts or pot holders on the handles? The most versatile cookware you can buy. Cast iron cookware can withstand high heat on top of the stove or in the oven. Properly seasoned it will last forever. Muffin pans in the shape of cute bugs, butterflies, and flowers, for fun cupcakes. They make great Christmas presents for a family where the kids like to help out in the kitchen.